Since an early age, I have always been told, and taught that there was much meaning and truth in the old saying that the “Truth Will Set You Free.” After all, my sister and I grew up in a very religious home. And, it didn’t take our parents long to quote the scripture found in the Gospel of John, Chapter 8, Verse 32. On Saturday afternoon, and the one (and, perhaps, the only) time that the world of Thoroughbred racing turns its’ collective attention to some obscure place in Bensalem, PA. and a racetrack known as Parx Racing, we got yet another ugly dose of why the industry desperately needs to develop a better, more uniform, more consistent way of determining what is a foul. And, more importantly, the industry desperately needs to develop a more fair and equitable way to evaluate whether or not that alleged foul is so severe that it requires humans in a booth to determine the winner of a horse race, rather than the horses on the track. Rather than jumping at the chance to make that decision, as much as humans love to interject themselves into the decision-making process, that should be the last option. Not the first. Rather than rendering their opinion of who the best horse is or was, the deference should be given to what happens on the track. And, like in other sports, only if there is clear, convincing video evidence that something was wrong, then the decision on the field of play should stand. But rarely does that happen in horse racing. Rarely. All summer long, those of us who are fans of Thoroughbred racing have seemingly watched race after race where someone has alleged that a horse and/or rider have caused interference to such a degree that the official order of finish should be changed, reversed, amended, or altered. It happened at Saratoga, in some of the best races of the year. It happened at Del Mar, in some of the best races of the year. It happened at nearly every place in-between, in all kinds of races throughout the year. And, on Saturday, in the Grade 1 Cotillion Stakes at this place called Parx Race Track, located near Philadelphia, Pa., it happened again. Late in the stretch of that major racing event, when the race was now down to just two combatants, the brilliant Monomoy Girl — clear on the front end and with dead aim on the finish line — moved a couple of strides toward the rail. Midnight Bisou, rallying from behind, was then guided to the outside by her rider, the Hall of Fame jockey Mike Smith. Even though there may have been room to go inside, Smith — instead — choose to go out. It was then, just a few hundred feet from the finish, that Monomoy Girl and her rider, Florent Geroux, began to drift back outside. Still clear and making no contact with her adversary, she moved out a path. Smith and Midnight Bisou inched wider. Clear and still making no contact, Monomoy Girl drifted a bit more. Maybe another half-of-a-path. Smith and Midnight Bisou inched wider. It was not long after the horses crossed the finish line — in that same, exact order — that Smith lodged a rider’s objection. And, the wait was on. And, on. And, on. Finally, the Parx stewards made a decision. They changed the finish, disqualifying Monomoy Girl and placing Midnight Bisou first. I think it was one of the worst calls I have seen in a really long time. Horrible. Wrong. Disgusting. Pathetic. I think I used all of those words at some point immediately following the race. Whether or not you agree or disagree with the final decision, there were some real problems associated with the call, and the subsequent actions of the stewards. First of all, the only thing consistent about racing referees’ rulings — all over the country this year, and in past years — has been inconsistency. And, arguably, incompetency. Just a few weeks ago, in the Grade 1 Personal Ensign Stakes at Saratoga, the same Mike Smith was riding Abel Tasman near the rail when Jose Ortiz and Elate came ranging up on his outside nearing the wire. Smith guided his horse out, actually bumping Elate on a couple of occasions, in the final strides. At the wire, Abel Tasman had held off her foe. But, as soon as that race was over, the stewards put up the inquiry sign and Ortiz claimed foul. After some debate, though, the stewards at Saratoga allowed the finish to stand. Bumping, yes. Yet, no change. It is OK to bump a horse and exchange physical blows in the deep stretch, but it is not OK to simply move over or out a path — even if you are clear? Secondly, the same standards that stewards hold for the finish of the race do not apply at the beginning, or, for that matter, on the backside. Early in races, horses — at the instruction of their respective riders — move paths all the time. Sometimes, those moves cut horses off. Sometimes, riders have to check their horses and they lose all momentum. Sometimes, both the rider and horse have to steady. Happens all the time. Yet? No one ever alleges interference then. No one ever throws a fit then. But why doesn’t it matter? Doesn’t the same foul exist early if it exists late? Third, unless you are a better sleuth than I am, you can’t find the names of the Parx racing stewards any where. Not on the Parx Racetrack website. Not at the Pennsylvania Racing Commission website. Not anywhere. So, who are these anonymous racing experts? What are their respective credentials? What expertise do these mystery people possess? What accreditation have they earned; studies have they completed? How do we know that they are credible? I would argue that unless you are willing to put your name on a decision, then you are not capable of making that decision. Fourth, after the races were concluded, no member of the media was able to interview or find out the reason for the disqualification. According to some report on Sunday, the stewards are not available to the press. That is pathetic. Maybe they don’t have to answer to their reasons to the press. But they should have to respond to the bettors. The people that put up their money. The people that make the whole game exist. The stewards do owe them an answer. Doesn’t make any sense that they do not have to answer for their actions. Until such time that the industry does look at this issue as a problem — and it truly is — then the powers at be at TOBA, which designates what races are classified as Graded Stakes and determines which races are Grade 1s, should demand minimum standards in the Stewards box. For any race to be determined as a Grade 1, then the racetrack and racing jurisdiction shall relinquish any and all decisions to a gold-standard panel of arbitrators that is chosen, selected and chaired for any Stakes event of this level. The 7-person panel — who have achieved a level of expertise through accreditation and experience — shall be the only governing body for this race, no matter where the event is located and held. And, this group shall be the only ruling body and shall review any and all claims of foul or inquiry, and issue any final rulings. That would give the industry — at its’ very best races — a level of consistency. That would give the industry a gold standard of qualified umpires. That would give the fans and bettors a sense of equality, consistency, and credibility that is above local influences and home rule. Now, that makes some sense. As you know by now — especially if you read these pages — it was about a year ago when Keeneland and Churchill Downs announced that they had agreed to join forces and create a joint working relationship. One of the first things that this new entity did, at the time, was file applications to build, own, and operate new racetracks in two rural parts of Kentucky. Now, after a long wait, it appears that the Kentucky Racing Commission is ready to start accepting those applications and any others that may come in, and, hopefully, will soon render a decision of whether or not millions of dollars will be invested and infused into the industry in the Commonwealth. While this should be great news for both the Commonwealth — which desperately needs to encourage all the new business activity that it can, and solicit these two respectable and historic institutions to inject significant money into these real economies — and the entire horse industry, I have been a bit shocked by some people in the industry who have claimed foul, and have made allegations that both Churchill and Keeneland are simply trying to steal market share from some existing racetracks. Officials at Kentucky Downs have cried alligator tears and whined to anyone that will bend an ear that if Churchill Downs and Keeneland are allowed to build, own and operate a new racetrack facility in or near Oak Grove, in Southwest Kentucky, that Kentucky Downs will suffer a damaging blow. They have argued that this newly proposed location is in Kentucky Downs’ “backyard.” They have claimed that this newly proposed facility is in their market area. They have claimed that this new development should be “theirs” and not the industry’s. They have claimed all kinds of things. Although, to date, there has been no scientific data or economic impact studies distributed to validate these “claims,” some of Kentucky Downs’ friends and family have taken to all forms of social media to spread this allegation, as well. But it may be time for a little John: 8-32. Let’s look at the truth. After all, it will set you free. According to the “Distance Calculator” found at www.globefeed.com, the driving time from Oak Grove, in rural Christian County to Kentucky Downs, located in Franklin, Ky., is 1 hour and 20 minutes. (Even though some of the track officials in Franklin claim that it is “under an hour.”) The travel distance, by the closest roads, is 61.3 miles. The estimated travel time between four other racetracks in Kentucky — who are currently licensed and are conducting business — are less than that estimated time of 1 hour and 20 minutes that it normally takes to drive from Oak Grove, KY. to Kentucky Downs. And, that is according to the same arbitrary and independent source. Plus, according to the source, there is one other travel time that is just five minutes longer between two existing racetracks. One, the projected travel time between Keeneland and the Red Mile, both of which are located in Lexington, is just 5.6 minutes. The distance is a short 12 miles. Two, the projected travel time between Keeneland and Churchill Downs, the two giants in the sport, is just 1 hour and 14 minutes down I-64. The distance is 72.1 miles. Three, the projected travel time between Keeneland and Turfway Park, located in Northern Kentucky, is only 1 hour and 15 minutes. The distance is 77.8 miles. Four, the projected travel time between Bluegrass Downs, located in Paducah, and the proposed track in Oak Grove is 1 hour and 19 minutes. the distance is 85.9 miles, but right down I-24. And, fifth, the projected travel time between the newly proposed facility in Oak Grove and Ellis Park, located in Henderson, KY. is 1 hour and 25 minutes. Just 5 minutes longer than the expected drive time to Kentucky Downs. Then, there is the projected travel time between Churchill Downs and Turfway Park — which is 1 hour and 30 minutes. That is 10 minutes longer than the newly proposed facility in Oak Grove to Kentucky Downs. The distance is 94.4 miles, but is connected by I-71 and I-75. In essence, the argument that the newly proposed track in Oak Grove will hurt business in Franklin at Kentucky Downs because it is simply “too close,” just doesn’t hold water. At the very least, it will have no more of an impact than any of the other tracks that are currently doing business have on each other. Right now. Today. If you truly believe that the length of that travel time is too close in proximity, then none of the other tracks in the state should have ever been located as close to each other as they are today. That is simply not true. Especially in relationship with all the other tracks — whose ownership teams have not whined about their in-state partners. After all, when Kentucky Downs was initially licensed to conduct live racing as Dueling Grounds, the driving distance to Ellis Park was just 1 hour and 56 minutes. That’s just 26 minutes farther than Churchill Downs to Turfway Park. As a race fan, I fully understand why many people are disappointed that the highly-touted colt Instagrand has been pulled from serious training right now, and will not be pointed to many of the Fall’s best Stakes events — including a possible run in the Claiborne Breeders’ Futurity at Keeneland and the Breeders’ Cup Juvenile at Churchill Downs in November. As a race fan, you always want to see the best of the best run. And, this one certainly falls into that category. The son of Into Mischief won his first race ever by a whopping 10 lengths, and he did it in a rapid-fire time of :56 flat for the 5 furlongs. Amazing. He came right back to win the G2 Best Pal Stakes in his second star by 101/4 lengths — as easy as it could ever be. He covered the last quarter of that event in an amazing :23.73. Wow time. Every horse fan wants the chance to see one like that, whether it be in person or in competition. We love superstars, and this one certainly appears on his way to becoming just that. 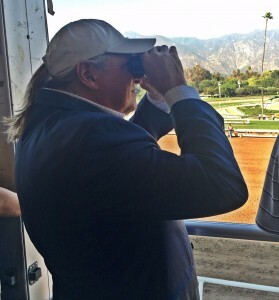 I have found it interesting that a whole lot of people are so critical of owner Larry Best, who recently decided to suspend the training of his brilliant colt and pull him from consideration for this year’s Breeders’ Cup Juvenile. Truthfully, that self-centered criticism is not warranted. It isn’t fair. And, to be honest, it’s not our call. Larry Best took out his wallet to purchase Instagrand for $1.2 million at a 2YO In-Training Sale. He gave him to Jerry Hollendorfer to train. And, he ran a hole in the wind and right into our imaginations and hearts. But if the owner thinks that it is best to give the talented colt a rest break and allow him to mature and get ready for what surely will be an arduous campaign toward the 2018 Triple Crown, then we must accept that the decision is in the best interest of the horse. Long term. After all, the last time I checked we don’t have all the information. We don’t have all the details. And, we don’t know how the horse is doing as he grows and matures from a promising 2YO into what may be the next best thing since, well, since Justify. The Breeders’ Cup Juvenile has not been a great prep for the Kentucky Derby and the Triple Crown. And, the Kentucky Derby and the Triple Crown still remain the Holy Grail worth chasing most. Going into this September, I heard some grumbling from some major consignors that Keeneland was changing its’ format for the world’s biggest, and most prestigious Yearling Sale, and that the changes were not needed or merited. Too many changes. Too many horses. Too much down time. Too many days. On Sunday, the Keeneland September Yearling Sale roared to a conclusion. And, when all the hammering was done, the Sale’s numbers had reached near record highs once again. In conclusion, the 13-day auction accumulated $377,130,400 in total sales. That was the fourth highest total in September Sale history, and came close to the glory days of the 2000s. The average price this year was higher than last year’s record. There were 27 horses sold for $1 million or more. Three yearlings sold for $2 million-plus — which was the most since 2007. And, the $2.4 million paid by Coolmore’s M.V. Magnier for a War Front colt is the top price paid for a yearling in the entire world this year. Keeneland knows how to conduct a horse sale. They have this thing down. May want to consider that the next time you want to take umbrage with the people that make you money.